Slaven Bilic has managed in Croatia, Russia, Turkey and now the Premier League. 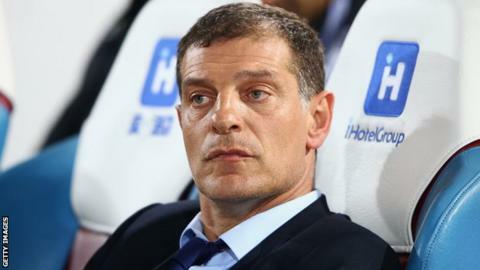 West Ham manager Slaven Bilic says the disappointing results picked up by English teams in the Champions League are no surprise - as Premier League sides underestimate their opponents. Manchester City, Arsenal and Manchester United all lost in midweek. But Bilic, whose Besiktas team beat Liverpool last season, said: "Why are people so surprised when Manchester United lose a game against PSV? "It isn't a shock. You have to know that the other teams are also good." Chelsea were the Premier League's sole success in the Champions League this week, winning 4-0 at home to Maccabi Tel Aviv. United lost 2-1 in Eindhoven, Arsenal were beaten by Dinamo Zagreb and City, who play West Ham on Saturday, lost at home to Juventus. Chelsea are the only Premier League side to reach the semi-final of the Champions League in the last four seasons and Bilic, whose West Ham side failed to make it past the Europa League qualifying stage in August, believes English clubs take European sides too lightly. Bilic said: "Many big clubs have lost at PSV, They were European champions once. "You can lose in Zagreb. It was a major surprise, the whole of Croatia is surprised, but it can happen. "They play football there as well. They are a decent team, unbeaten in 41 games or whatever. "For you it was probably a shock when Besiktas knocked out Liverpool last year. For us it wasn't." Ronaldo? Sure. Who else is in our Champions League team of the week? Read more on Ronaldo? Sure. Who else is in our Champions League team of the week?